Looking to land employment as a lifeguard and earn some extra cash? You’ve come to the right place. 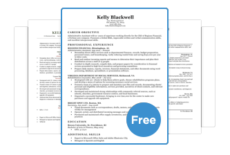 Download our free resume template, learn how to organize your experience into it, and edit it at your own pace. Or, if you are short on time, try out our easy-to-use resume generator and create your resume in minutes. Not the job or industry you’re looking for? View our complete list of resume examples. Ready to move on? Check out our expansive cover letter collection for pointers on how to perfect your cover letter. Swimming pool lifeguard with 2 years of experience keeping guests safe and happy. Able to maintain pool chemical composition, and use a variety of essential pool cleaning tools. Seeking employment at the Cougar Swimming Pool while majoring in Marketing at the College of Charleston. 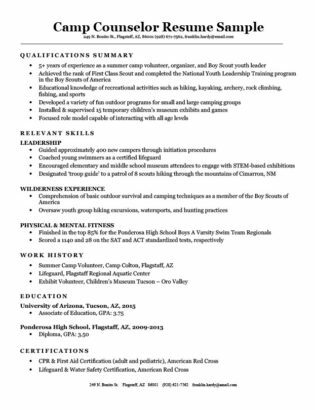 Take a look at this lifeguard resume sample and note the certifications listed, which will be a must if seeking employment with any private company or at a public beach. Also, note the experiences listed under the education section. This is a strong resume even without a university degree because of the experiences the applicant had in high school, including being captain of a relay swim team and also competing in intra-olympics as a swimmer. Combined these make for a strong educational section. Also, make sure to define which area of lifeguarding you have expertise in. This may range from on the beach in the tropical sun or in the chlorine engulfed surroundings of your government run swimming pool. Either way, make your stellar lifeguard resume swim upstream past the competition. By the way — have you been lifeguarding on and off for a long time, leaving large gaps of work experience? Here are 6 ways to eliminate work experience gaps. 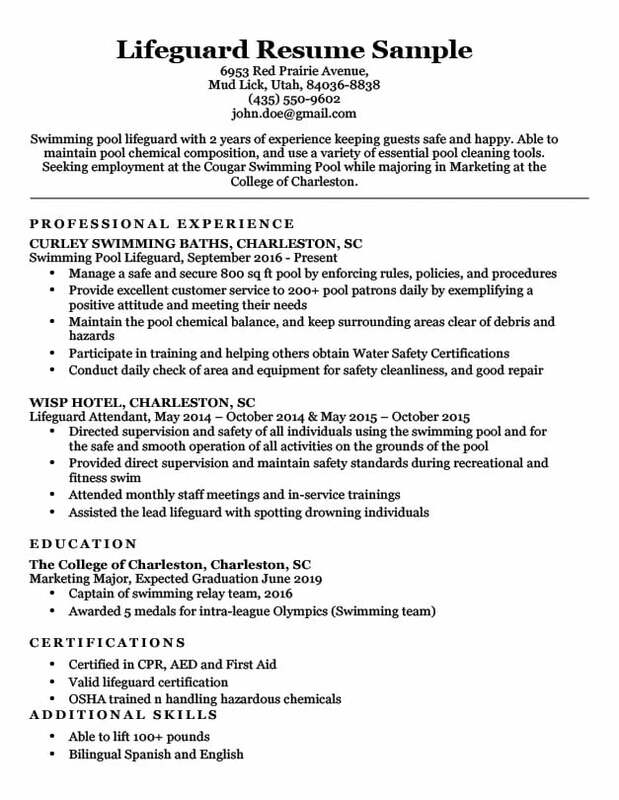 The above resume is a solid example of what an experienced lifeguard’s resume may look like. If you imitate the above sample you will undoubtedly end up with a great looking resume, but even angels have their flaws, and so here we will highlight some of what makes this resume sample great and what could still be improved. The job experiences listed are all completely pertinent to the job, and don’t include any non-relevant experiences. The candidate lists critically vital skills such as CPR/AED and First Aid. The applicant included non-directly related but very valuable additional skills such as being able to rescue up to 300lbs. Include some more numerical quantification similar to how they wrote out “300 lbs” in the additional skills section. Attach a cover letter written and designed specifically for the position being sought. Don’t like this resume template? View our complete database of downloadable resume templates.